If your child is a fan of the Sesame Street muppets, you may be wondering, "Where can I purchase Abby Cadabby," a newer character on the ever-popular children's show. While it's hard to find one of these toys at your local department store, the good news is you can purchase various types of Abby Cadabby dolls at several stores online. In 2006, at the beginning of Sesame Street's 37th season, three-year-old Abby Cadabby (a play on the word abracadabra) was introduced and was the first new female character on the show in 13 years. She is a fairy-in-training and playmates with Elmo, Rosita, Zoe and Baby Bear. Abby Cadabby was brought on the show to teach lessons about cultural diversity and differences. What Is the Leapfrog Leapster? She has magical powers that allow her to disappear and reappear at any given time, floating around when she's happy and turning different items into pumpkins. Her catchphrase is, "It's so magical!" Her wand doubles as a cell phone, which she uses frequently to keep in touch with her mother. She also speaks the make believe language of Dragonfly, which she is teaching to other friends on Sesame Street. Abby Cadabby Plush: Made by Gund, this doll is 12 inches tall with white mesh wings and pink/purple yarn pigtails. You can also find 23-inch size dolls in the same design. Abby Cadabby Bendable Poseable Plush: At nine inches tall, this doll has bendable arms, legs and body. Beanbag Abby Cadabby: This is a small, six-inch beanbag doll, similar in size to a Beanie Baby. Teach Me Abby Cadabby: At more than 14 inches tall, this doll teaches youngsters some fundamentals such as buckling, buttoning, snapping, zipping and using Velcro closures. Sweet Dreams Abby: From Fisher Price comes this musical Abby Cadabby who sings a soft lullaby while dressed in a cute purple nightgown. Her frog Prince is included. Cuddle and Care Abby Cadabby: Also from Fisher Price, this baby Abby Cadabby comes with a removable diaper, a toy, birth certificate and baby carrier. She even smells like baby powder! 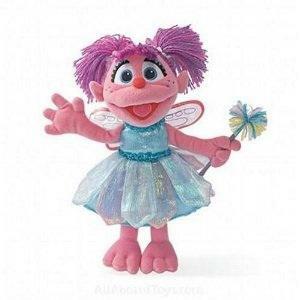 Abby Cadabby Jumbo: At 39 inches tall, this lovable toy comes with a shimmering blue dress and matching fairy wings. Hopefully this answers your question, "Where can I purchase Abby Cadabby?" While she may not be as popular as her buddy Elmo, her uniqueness and fun-loving nature is a welcomed addition to the powerhouse children's show. With an Abby Cadabby doll, your youngster will have hours of fun pretending to be a fairy-in-training.